Improbable's latest technology update massively eases the load when devs are creating multiplayer games. Improbable created its SpatialOS platform to enable small teams to create the kind of massive games normally reserved for AAA studios, whether that’s MMORPGs or Battle Royale shooters like Mavericks. 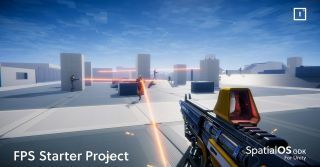 Today, the company has released a new product update called a Game Development Kit (GDK) for Unity—and they’ve bundled a test project in it, a working 200-person FPS, which users are free to remix into their own groundbreaking games. “We had a lot of feedback from developers that our technology was impressive but that they wanted it to work more closely with Unreal and Unity,” said Paul Thomas, who oversees the tech for Improbable. “So, with the new GDKs, we’ve tried to make each of them stay inside the engine’s workflow as much as possible.” The SpatialOS GDK for Unity was released in early October, with hundreds of developers already using it; a similar GDK for Unreal Engine is due out at the end of the month. Already, Improbable’s graduate engineers have run a week-long game jam with the starter project, remodelling it into genres ranging from traditional Battle Royale (complete with shrinking circles of death), King of the Hill and Team Deathmatch games to more adventurous RPG and adventure styles. This is just the start: the 200-person limit is from the free tier of SpatialOS, but developers can create game worlds with thousands of players and tens of thousands of AIs. Indeed, prior to the GDKs’ release, other veteran developers have been experimenting with them to create prototypes of games that might not be otherwise possible. For example, Trond Fasteraune (Beyond the Sleep) has been using SpatialOS and the GDK for Unity to create something he calls a mini-MMO, featuring asymmetric gameplay, persistent base-building and AI factions. He’s impressed. With the release of the GDK for Unreal on October 25th, Improbable’s engineers are supporting the kits with smaller releases—off-the-shelf packages for important elements of game design—such as pre-built health systems, control schemes, multiple platforms, and so on. “We really do want to make it so you can make any kind of multiplayer experience on SpatialOS, with any game engine, ranging from small-scale co-operative games and 200 person FPSes to fully-fledged MMORPGs and grand strategy games on a global scale.” say Thomas. For now, for any new developers, the FPS Starter Project is the place to start. What will you make?